What we do and why . . . The World Health Organisation have recently concluded that air pollution is now implicated in more than 7 million deaths each year and tens of millions of respiratory and other illnesses. It damages ecosystems and reinforces the cycle of poverty in many areas of the world. IUAPPA's goal is to help develop and promote solutions. It brings together voluntary associations and public bodies throughout the world to share the information and experience needed to develop more effective policies. It promotes the World Clean Air Congress and regional meetings, supports technical and policy development, and leads international initiatives such as the Global Atmospheric Pollution Forum and contributes to initiatives such as the Climate and Clean Air Coalition. 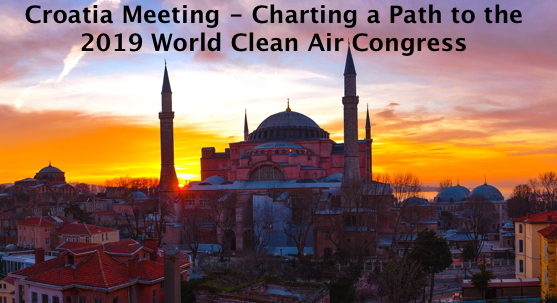 With the next World Congress in Istanbul only two years away, this year’s Annual Meeting of the Union - in conjunction with the annual conference of the Croatian Air Pollution Prevention Association - will be devoted largely to planning the Congress programme. The aim is to build on the great success of last year’s Congress in Korea, and ensure that the 2019 Istanbul World Clean Air Congress contributes further to the search for solutions to the global challenge of air pollution. See the programme for the 2017 Annual Meeting.